Chris Lakey, a swinging 15 year old, played the alto saxophone in the orchestra. 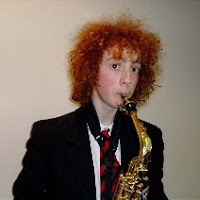 He also plays in the jazz band and has been playing and practising the alto sax for six years. Imagine – a hundred-strong orchestra, three hundred voices in the choir and a packed Sage! That was the scene last month when the Ponteland Proms gave their annual performance. Started 14 years ago all the Ponteland schools, the Community High, the Richard Coates Middle, Ponteland Middle, Darras Hall First and Ponteland First, were involved as well as the First Schools of Stamfordham, Belsay, Whalton and Heddon on the Wall. The logistics of organising the event and the enthusiasm that carried it forward are a testimony to all concerned. Paul Reid, head of music at the High School, conducted the orchestra and Ed Milner of the County music services, conducted the choir in a range of the very popular Beatles’ songs. Feet were tapping and hands clapping to the rhythms of a great performance. Imagine – when the children’s grandparents were teenagers these songs and their sharp-suited singers were considered to be rebellious and radical and their young fans screamed their approval!